Deerhoof have gotten exceedingly adept at messing with our expectations. For every album they release that’s labeled as more straight forward and accessible—I’m looking at you Apple O—they go and release one (Milk Man, anyone?) that seems hell-bent on ostracizing their newly christened fans. I don’t think it necessarily has so much to do with their fans being disappointed with the new album but that it just hit such a different set of musical pressure points that the difference might have been a bit too jarring for their more casual fans. Then again, they’ve never been a band to follow any sort of rigorous set of rules or conform to convention when it comes to their music, so fans really shouldn’t be that surprised at their somewhat disordered creative trajectory. 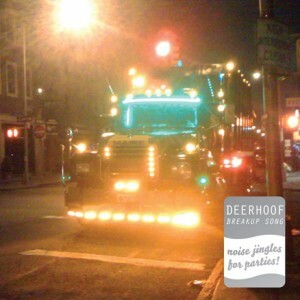 All you can generally say about any given Deerhoof record is that it sounds like a Deerhoof record. It’s difficult to find any sort of comparable band, other than say, Liars, that makes records so cheerfully belligerent in regards to their being categorized and catalogued. From the first few seconds of “Breakup Songs”, the angular, distorted rocker that opens their newest record Breakup Song, the band shows how deft and complicated their seemingly unstructured songs can be. The track has a decidedly jagged feel to it. If you accidentally brushed up against it, you’d have to worry about getting a tetanus shot. With singer Satomi Matsuzaki’s repeated refrain of “When you say it’s all over/ Hell yeah anyway” the song feels about as willfully independent as a song can be and still make you want to get up and throw something out of place trying to dance to it. Regardless of the inspiration for the song, the band never allows the track to wallow in any kind of misdirected antagonism. The song sounds so unabashedly vibrant that any noticeable surface hostility is washed away by the time the song comes to its end. The band seems to be having a great deal of fun turning the idea of a breakup song on its head and crafting something so deliberately at odds with our expectations that even their choice to call the album Breakup Song can be seen as an attempt to subvert our assumptions, as these songs don’t really sound like any breakup songs you’re likely to have heard. In the initial press release for the album, drummer Greg Saunier described the album as “Cuban-flavored party-noise-energy music”. And despite that not really giving you a lot of specifics regarding the albums composition, it does give you an idea of its influences. There is a heavy South American vibe that plays out across these tracks. 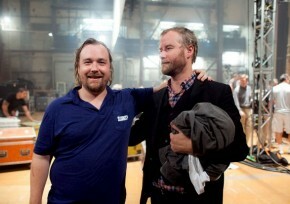 You could even toss around names like Tom Ze and Os Mutantes and you wouldn’t be too far off the mark. But even those observations are just critical window dressing. The album is full of references and allusions to other works and can function as a kind of two-way mirror for each band member’s set of personal musical preferences. Breakup Song is about as immediate in its ability to draw the listener into its shifting, malleable perspective as any Deerhoof record in recent memory. The album follows up its playfully terse opener with one of Deerhoof’s best songs in years, the eccentrically segmented “There’s That Grin.” The song seems to be racing in so many different ways stylistically that it has every reason to go flying off the rails and crash by the side of the road, but the band never loses control for an instant. It only goes where they want it to go. And under that firm direction, it becomes an ever-changing exhibition of their influences, with the horns, surging electric guitars, and overt electronics all serving the need of each member’s particular musical interests. The band draws back to its roots with the spastic, mechanical “Bad Kids to the Front”, an electronic throwback to songs from releases like Reveille and Milk Man. It’s a nice reminder from the band that, no matter how often they pursue a particular course of inspiration on an album, they are always well aware of their own musical history. That’s not to say that the band won’t completely upend their usual creative methodology if something strikes their fancy, as it does on Breakup Song, but there is always purpose and reason behind their choices. Nothing is random on a Deerhoof album, despite the apparent evidence to the contrary. Their love of all things musically interchangeable is most obvious on lead single “The Trouble With Candyhands”, as it plays fast and loose with the idea of Deerhoof recording what is, for all intents and purposes, a mambo. Of course, the track is intercut with distorted squelches and multiple stop-start rhythmic psych-outs, so it does have those particular touches so characteristic of the band’s previous work. And here is where the acknowledged Cuban sway is most evident, with the songs’ predilection for salsa horns and a deconstructed timba beat rising and falling behind the electronics, with Satomi’s high-pitched yelp documenting a shaky relationship through the cryptic lyrics “I can tell bad boy/I allow you one phone call/Then you bring me flowers”. But again, this kind of fractured style of songwriting is something that Deerhoof have been doing for years. In lesser hands, these disjointed lyrics and this seemingly incoherent pastiche of genre trademarks might sound slapdash and hurriedly thrown together, but on Breakup Song, all these disparate influences and irreverent toss-offs come together to showcase the bands continued maturity, even if some tracks do feel superficially immature. I spoke earlier of the record having a distinct affinity for South American music, specifically the tropicalia and psych-influenced artists of the late 60’s. But for American fans, the attraction to those bands seemed less about a strict interpretation of their lyrics and more about the feel of the songs. The same can be said for this album. The songs on Breakup Song focus on creating very particular moods and musical moments because if you’ve followed Deerhoof for any length of time you know that their lyrics have never been particularly strong. They suit the music and never get in the way of a great song, but for critical assessment, they can, at times, sound underdeveloped and not especially imaginative. Those same complaints can be leveled at the songs on this album as well. They’re very light on lyrical content, maybe one or two lines at most for each track. And although the lyrics are not particularly memorable on their own, they are given new life in the context of their respective songs. The band does seem to have a preternatural knack for developing impressive singular musical moments, such as when the fuzz guitar kicks in on rocker “We Do Parties” or when Satomi sings “I declare the war over anymore/Ready for a laugh/Ready to be tough as a robot on the dancefloor/A muscle in the heart” in such a confidently independent voice on album closer “Fete D’Adieu” that any notion of heartbreak is quickly dismissed. But I think that’s the point. These are unconventional songs about unconventional heartache. And just as every person reacts differently in different situations, so too does Deerhoof. I don’t know if I’d make the case for Breakup Song being the Deerhoof album that feels most indebted to the band’s influences, but there is certainly ample evidence to that end. I do think that the album feels stronger than its predecessor Deerhoof Vs. Evil, a record that I felt was underappreciated when it was released last year. This record definitely ranks up there with Offend Maggie and The Runners Four in regards to its emotional immediacy. Even at its most quixotic, it just sounds fun. This fact is all the more impressive given that the album is ostensibly about how the band tries to work through various stages of heartache. And while it may sound at times as though the band doesn’t take itself as seriously as it should (the whimsical sounding “Mario’s Flaming Whiskers III” or the funk-rock bass on “Mothball the Fleet”, with lyrics like “Prepare yourself/I now pronounce you earth animal”), I think that’s just par for the course when it comes to this band. Throw your expectations out the window. It is a Deerhoof record, after all.